The artist’s work is inextricably linked with his native nature. Perhaps, therefore, among his paintings most landscapes. Calm backwaters and frisky streams, light groves and hidden paths running away along the edge of the grain field. All this was subject to the brush of the great Russian artist. 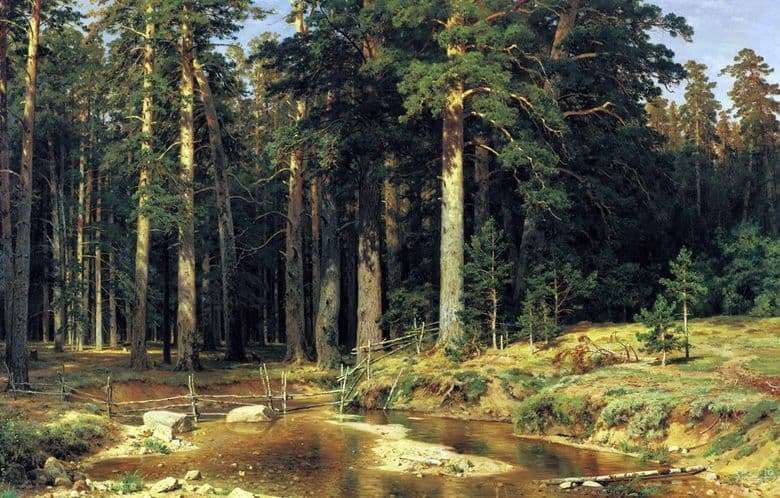 “Ship Forest” was one of the latest works of the master. The amazing transparency of the air and the clarity of perspective create a feeling of spaciousness. Tall old spruces stand seemingly like a solid wall. However, there is a place here and a playful stream, reflecting the tops of ancient trees. Little Christmas trees, timidly embarrassed to the roots of the giants. Solar glade, where the sun tangled in the grass glare. The combination of ship pines and small shoots creates the contrast of the age-old firmness and openness to the new, young. Wisdom and experience, preserving a new life. Calm beauty, fortress and peace breathes from the landscape. The harmony of each shoot and the beauty of each sunbeam that accidentally flashed in the creek is emphasized by the thoughtfulness of the composition. Warm, honey tones in combination with dark greens make you literally smell the freshness of resinous branches, hear the soft talk of a stream that has laid its course between the forest giants. A scattering of stones heated by the sun, a small hedge crossing the stream. Everything breathes the beauty of the native land. Realism of the smallest details and masterly mastery of the art of halftones and contrasts allowed the artist to recreate a piece of his native forest, where everyone will find the features that are dear to his heart.